We are 9 days into the New Year. How are you doing on your resolutions? Me? I'm doing pretty good. Although not with resolutions, resolutions stress me out!!! I have made goals instead. To me a resoltion feels like a one time shot. So if your resolution is to not eat sweets and you have cake at your son's birthday party then it's blown and you have to wait until next year to try again. Goals feel much more doable to me. If you have cake one day, you just try harder to eat better the next day. One of the ways I am trying to keep myself motivated to accomplish these goals is to join the one little word craze. 1. A course of action that one intends to follow. a. An aim that guides action; an objective. My goals will be easier to meet if I do them with INTENTION! 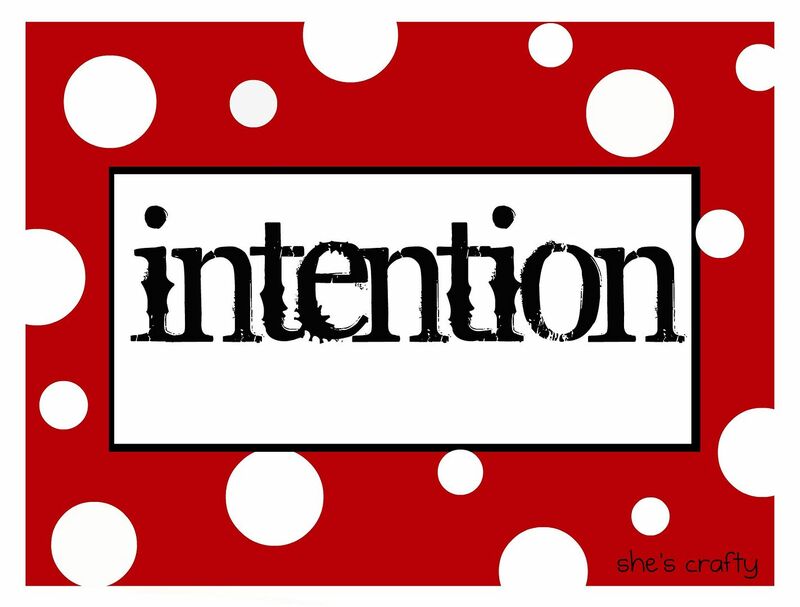 Living with intention means living with a plan. It means planning to drink more water, planning our meals ahead of time, planning time with friends etc. It means not mindlessly consuming treats or spending hours on-line or wasting time (not that I do that much anyway- but still). I am inteneding on 2012 being our best year yet!! What are your goals/resolutions for 2012? Did you choose One Word? My word is a lot like yours! I chose purpose. I basically want to do things with purpose (and intent) as well!